Sazia Sharmin*, Atsuhiro Taguchi*, Yusuke Kaku*, Yasuhiro Yoshimura*†, Tomoko Ohmori*, Tetsushi Sakuma, et al. Glomerular podocytes express proteins, such as nephrin, that constitute the slit diaphragm, thereby contributing to the filtration process in the kidney. Glomerular development has been analyzed mainly in mice, whereas analysis of human kidney development has been minimal because of limited access to embryonic kidneys. We previously reported the induction of three-dimensional primordial glomeruli from human induced pluripotent stem (iPS) cells. Here, using transcription activator–like effector nuclease-mediated homologous recombination, we generated human iPS cell lines that express green fluorescent protein (GFP) in the NPHS1 locus, which encodes nephrin, and we show that GFP expression facilitated accurate visualization of nephrin-positive podocyte formation in vitro. These induced human podocytes exhibited apicobasal polarity, with nephrin proteins accumulated close to the basal domain, and possessed primary processes that were connected with slit diaphragm–like structures. Microarray analysis of sorted iPS cell–derived podocytes identified well conserved marker gene expression previously shown in mouse and human podocytes in vivo. Furthermore, we developed a novel transplantation method using spacers that release the tension of host kidney capsules, thereby allowing the effective formation of glomeruli from human iPS cell–derived nephron progenitors. The human glomeruli were vascularized with the host mouse endothelial cells, and iPS cell–derived podocytes with numerous cell processes accumulated around the fenestrated endothelial cells. Therefore, the podocytes generated from iPS cells retain the podocyte-specific molecular and structural features, which will be useful for dissecting human glomerular development and diseases. We have recently induced the nephron progenitors from mouse embryonic stem (ES) cells and human induced pluripotent stem (iPS) cells by redefining the in vivo origin of the nephron progenitors.13 The induced progenitor aggregates readily form three-dimensional primordial glomeruli and renal tubules upon Wnt stimulation in vitro. To analyze the detailed structures and transcription profiles of the induced podocytes, we have here inserted the GFP gene into the NPHS1 locus of human iPS cells via homologous recombination using transcription activator–like effector nucleases (TALENs)14 and generated glomeruli with green fluorescent protein (GFP)-tagged podocytes. To visualize developing human podocytes in vitro, we inserted a gene encoding GFP into the NPHS1 locus of human iPS cells by homologous recombination (Figure 1A). We first constructed a pair of plasmids expressing TALENs targeted in close proximity to the NPHS1 start codon. When tested in HEK 293 cells, these plasmids efficiently deleted the NPHS1 gene (Supplemental Figure 1A). We then introduced these TALEN plasmids, along with a targeting vector containing the GFP gene and the homology arms, into human iPS cells. This resulted in efficient homologous recombination and isolation of heterozygous GFP knock-in (NPHS1-GFP) clones (Figure 1B, Supplemental Figure 1, B and C). Successful generation ofNPHS1-GFP iPS cells by homologous recombination. (A) Strategy for targeting the human NPHS1 locus. TheGFP cassette was inserted upstream of the NPHS1 start codon. The puromycin-resistance cassette (PURO) is flanked by loxP sites. Positions for primers and probes for screening are indicated. E, EcoRV; N, NheI. (B) Southern blot of control (+/+) and NPHS1-GFP (GFP/+) clones. Genomic DNA was digested and hybridized with the indicated probes. Fluorescent visualization of human glomerular podocytes generated fromNPHS1-GFP iPS cells. (A) Morphologic changes of GFP-positive glomeruli during differentiation in vitro. The nephron progenitors induced fromNPHS1-GFP iPS cells were combined with murine embryonic spinal cord and cultured for the indicated time. Lower panels: higher magnification of the areas marked by rectangles in the upper panels. Note the shape changes of the glomerulus (arrowheads). Scale bars: 500 μm. (B) Histologic sections of glomeruli developing in vitro. Tissues at day 3, 6, and 9 after recombination with the spinal cord were analyzed. Top panels: Hematoxylin-eosin (HE) staining. Middle panels: GFP (green) staining. Bottom panels: dual staining with GFP and WT1. Nuclei were stained with 4′,6-diamidino-2-phenylindole (DAPI: blue). Scale bars: 20 μm. (C) Presumptive S-shaped bodies observed at day 4 (left two panels) and day 6 (right two panels). Serial sections were stained with E-cadherin (Ecad: magenta)/cadherin-6 (cad6: green) and E-cadherin (magenta)/WT1 (green). Arrowheads: WT1-positive presumptive glomerular regions. Scale bars: 20 μm. We analyzed day 9 sections at higher resolution to examine the apicobasal polarity of the induced podocytes. GFP was detected in the nuclei and cytoplasm of most cells in the round glomeruli (Figure 3A) because we did not attach any localization signal to GFP when generating NPHS1-GFP iPS cells. Nephrin proteins were distributed in a linear fashion in the iPS cell–derived glomeruli and at one end of the WT1-positive podocyte layer (Figure 3, A and B). These expression patterns significantly overlapped with those of type IV collagen, which was accumulated on the basal side of the podocytes (Figure 3C). In contrast, podocalyxin, an apical marker, was expressed in a manner mutually exclusive of nephrin (Figure 3D). Therefore, the induced podocytes exhibited a well established apicobasal polarity and nephrin proteins were properly localized at the basal side, where the presumptive slit diaphragm should be formed. We also observed nephrin-positive dots on the lateral side of the podocytes (Figure 3A, arrowheads), as reported in human developing podocytes in vivo.15 We found that these dots actually represent the filamentous structures encompassing the basal to the lateral side of the podocytes (Figure 3, B and C, arrowheads). Although further investigation is required, this may reflect the transit state of nephrin proteins shifting from the apical to the basal domain of the induced podocytes. Induced podocytes exhibit apicobasal polarity and basally localized nephrin. (A) Nephrin (magenta) and GFP (green) staining of the induced glomerulus at day 9. (B) Nephrin (magenta) and WT1 (green) staining. (C) Nephrin (magenta) and type IV collagen (COL: green) staining. (D) Nephrin (magenta) and podocalyxin (PODXL: green) staining. The left columns are at lower magnification to show a whole glomerulus. The right two columns are singly stained, while the left two columns represent merged images. Arrows: nephrin proteins localized to the basal domain; arrowheads: nephrin-positive dot-like or filamentous structures. Scale bars: 10 μm. We further analyzed the morphology of the induced glomeruli by electron microscopy. 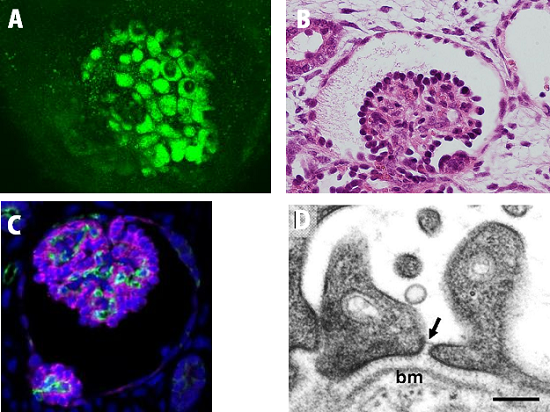 Both scanning and transmission electron microscopy showed well organized glomeruli surrounded by Bowman’s capsules (Figure 4, A and B). Interestingly, numerous microvilli were detected in the apical domain of the induced podocytes (Figure 4, C and D). Similar microvilli were reported in developing in vivo podocytes in humans.17,18 The podocytes were attached to each other at sites close to the basal region (Figure 4D). Inspection of the basal side of the induced podocytes by scanning microscopy identified multiple protrusions (Figure 4E), which were confirmed by transmission microscopy (Figure 4F). Higher magnification clearly showed bridging structures between the protrusions, which may represent an immature form of the slit diaphragm (Figure 4, G and H, Supplemental Figure 3, A–C). Thus, this is the first in vitrogeneration of mammalian podocytes with slit diaphragm–like structures from pluripotent stem cells. However, because typical interdigitation of the protrusions is lacking, they are likely to represent primary processes but not secondary processes (foot processes). Induced podocytes possess primary processes with the immature slit diaphragm–like structures. (A and B) Induced glomerulus covered with a Bowman’s capsule shown by (A) scanning and (B) transmission electron microscopy. 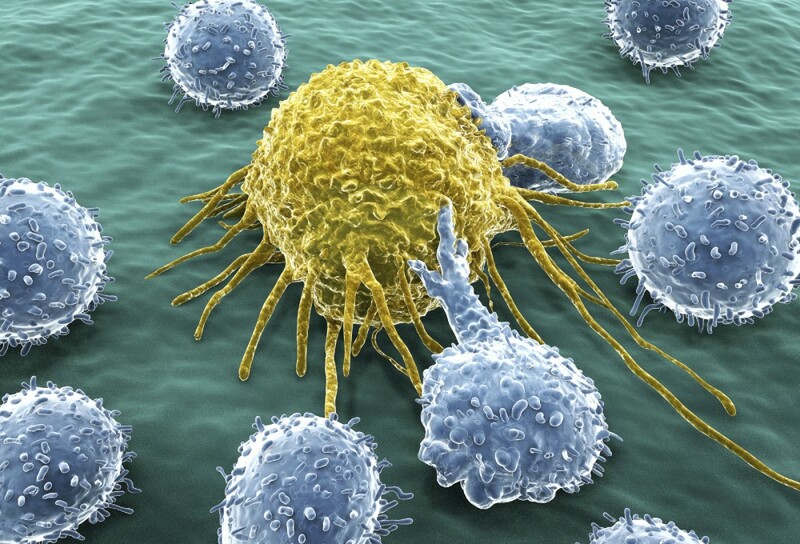 (C) Induced podocytes observed by scanning electron microscopy. Multiple microvilli are observed on the apical surface (arrowheads). (D) Aligned podocytes, which attach to each other at sites close to the basal region, shown by transmission electron microscopy. Multiple microvilli are observed on the apical surface (arrowheads). (E) Primary processes shown by scanning electron microscopy (asterisks). Podocytes from the basal side are shown. (F) Primary processes shown by transmission electron microscopy (asterisks). (G) Slit diaphragm–like structures between the primary processes (arrows), shown by scanning electron microscopy. (H) Primary processes with slit diaphragm–like structures (arrows), shown by transmission electron microscopy. Scale bars: A and B: 10μm; C–F: 2 μm; G and H: 0.2 μm. We next tried to purify the GFP-positive podocytes at day 9 by FACS. Of the induced cells, 7.45%±0.72% (mean±SEM from five independent induction experiments) were positive for GFP (Figure 5A, left panel). We also found that the monoclonal antibody against the extracellular domain of nephrin (48E11),19in combination with the anti-podocalyxin antibody, was useful for sorting developing podocytes. Of the GFP-positive cells, 94.0% were positive for both nephrin and podocalyxin (Figure 5A, middle panel), while most of the GFP-negative cells (97.5%) were negative for both markers (Figure 5A, right panel). Thus, GFP faithfully mimics nephrin expression and podocytes were enriched in the GFP-positive population. Quantitative RT-PCR analysis of sorted cells confirmed the differential expression of several podocyte markers, such asNPHS2 (encoding podocin) and synaptopodin (Figure 5B). When the sorted GFP-positive cells were cultured for 3 days, the cells expressed WT1 in nuclei and podocalyxin on the cell surface (Figure 5C). Nephrin and GFP were detected on the cell surface membrane and in the cytoplasm, respectively, at day 7 of culture, although expression levels were lower than before the start of the culture. These results indicate that induction from NPHS1-GFP iPS cells enables efficient isolation of developing human podocytes. Induction of podocytes from human NPHS1-GFP iPS cells enables their efficient isolation. (A) FACS analysis of induced tissues at day 9. Almost 8% of cells are positive for GFP in this representative experiment (left panel). Nephrin and podocalyxin (PODXL) expression in the GFP-positive or -negative fraction (middle and right panel, respectively). (B) Quantitative RT-PCR analysis of GFP-positive and -negative fractions. Average and SEM from three independent experiments are shown. 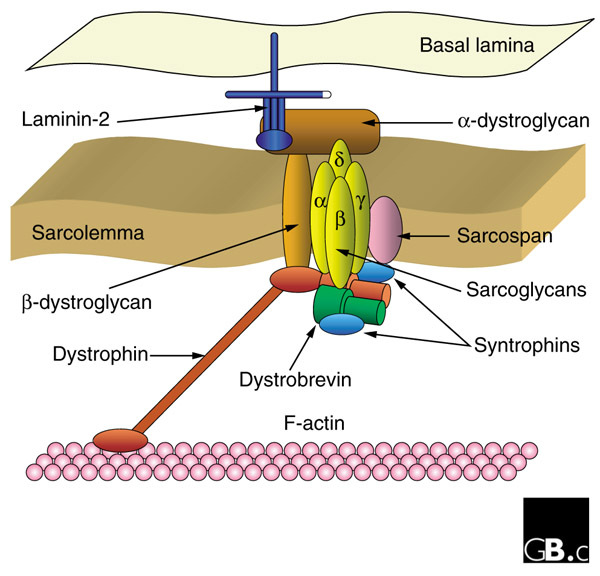 β-ACT, β-actin; SYNPO, synaptopodin. (C) Immunostaining of podocytes cultured for the indicated times after sorting GFP-positive cells. Scale bars: 5 μm. (D) Venn diagram of the transcription profiles of podocytes. Microarray data of GFP-positive podocytes are compared with those of human adult glomeruli and murine podocytes. To obtain comprehensive transcription profiles of the iPS cell–derived podocytes, we performed microarray analysis at day 9. We detected 2985 probes that were enriched in GFP-positive podocytes compared with GFP-negative cells. Of these, the top 300 genes were used for unbiased cluster analysis against microarray data from a wide variety of human tissues (Supplemental Figure 4, A and C).20 Genes enriched in the GFP-positive podocytes had variable tissue specificity. For example, NPHS2 was selectively expressed in the kidney or fetal kidney tissues. However, synaptopodin andFOXC2 were sorted into the ubiquitously expressing cluster. Dendrin was assigned to a cluster enriched in the neuronal tissues. These results suggest a single molecule is not sufficient to confirm the identity of podocytes. Therefore, we compared our gene list of GFP-positive human podocytes with the published microarray analyses of adult human glomeruli and adult podocytes from Mafb-GFP transgenic mice.11,21 Overall, 190 probes were overlapping among the three gene sets (Figure 5D, Supplemental Table 1, Table 1). These included typical slit diaphragm–related genes, such as NPHS1, NPHS2,CD2AP,22 chloride intracellular channel protein 5 (CLIC5),23 and dendrin,24,25and basolateral adhesion molecules such as claudin 5 and integrinα3.26,27Phospholipase ε1 and nonmuscle myosin heavy chain 9 (Myh9), causative genes for hereditary kidney diseases,28–30 were also included. Transcription factors that have important roles in podocyte development, including WT1, MAFB, FOXD1, and TCF21, as well as vascular attractants such as VEGFA and semaphorin, were also expressed.1,2,31 Interestingly, when these selected overlapping genes were used for the cluster analysis against the microarray data from various organs described above, kidney and fetal kidney were segregated as separate clusters, suggesting the kidney-biased features of the overlapping gene set (Supplemental Figure 4B). We also identified genes common to GFP-positive podocytes and adult human glomeruli (Figure 5D, Supplemental Table 2), and genes common to GFP-positive podocytes and mouse adult podocytes (Figure 5D, Supplemental Table 3). The former includes BMP7,32 while the latter includes NEPH1 (KIRREL),FOXC2, ROBO2, and EPHRIN-B1.7,33–36 These results indicated that the typical transcriptional profiles are well conserved among our podocytes generated in vitro as well as mouse and human podocytes in vivo. In addition, extracellular matrix components characteristic of glomeruli at the capillary loop stage,lamininα5/β2/γ1 isoforms (corresponding to laminin 521) and type IV collagenα4/α5,37 were detected, the latter of which is the causative gene for Alport syndrome. These data indicate that the transition to these mature forms from immature laminin 111 and collagen α1/α2 has already occurred in vitro. Taken together, our podocytes induced in vitro possessed the typical features of those in vivo, not only in morphology but also in transcription profiles, further supporting the authenticity of our human iPS cell induction protocol. In addition, genes exclusively expressed in the GFP-positive podocytes are worthy of further investigation because they may include genes specific to developing human podocytes, a possibility that has not been addressed to date (Figure 5D,Supplemental Table 4). We next examined whether glomeruli generated from iPS cells integrated with the vascular endothelial cells. The iPS cell–derived nephron progenitor spheres were induced by spinal cord for 1 day in vitro to initiate tubulogenesis and were then transplanted beneath the kidney capsule of immunodeficient mice. We also cotransplanted mixed aggregates of human umbilical vein endothelial cells (HUVECs) and mesenchymal stem cells (MSCs) because these cells are useful for the generation of vascularized organ buds in vitro.38,39 When these aggregates were transplanted using a conventional method that we used for the transplantation of mouse ES cell–derived nephron progenitors,13 minimal nephron differentiation was observed at 10 days after transplantation (n=4) (Figure 6A). Because human iPS cell–derived aggregates were larger (approximately 1000 µm in diameter) than those from mouse ES cells (approximately 600 µm) and were instantly flattened upon transplantation (Supplemental Figure 5A), we hypothesized that mechanical tension of the capsule may have hampered nephron differentiation. Therefore, we inserted two agarose rods of 1100 µm diameter in a V-shaped position to release tension and secure a space for the transplanted aggregates (Figure 6B). We also soaked the rods with VEGF to enhance vasculogenesis.31 As a result, we observed immature glomerular formation at day 10 in the transplants, accompanied by blood vessels integrating into these glomeruli (n=5) (Figure 6, C and D). The vessels were preferentially clustered in the glomeruli among the grafted tissue (Figure 6D), suggesting that the iPS cell–derived podocytes possess the potential to attract vasculature. This is also consistent with microarray data showing VEGFA expression in our induced podocytes. Transplanted iPS cell–derived nephron progenitors form vascularized glomeruli. (A) Hematoxylin-eosin sections of tissues at 10 days after transplantation using a conventional method. Right panel: magnified image of the square in the right panel. kid, kidney of the host mouse. (B) Method for transplantation using solid agarose rods. Right panel: macroscopic view of transplanted tissue under the kidney capsule. Ag, agarose rods. (C) Hematoxylin-eosin sections of the transplanted tissue at day 10 in the presence of the rods. Right panel: magnified images of the square. (D) Vascularized glomeruli at day 10. Staining of WT1 and CD31. Right panel: magnified image of the square in the left panel. (E) Hematoxylin-eosin section of the transplanted tissue at day 20. Middle and right panel: magnified images of the squares in the panels on their left, respectively. 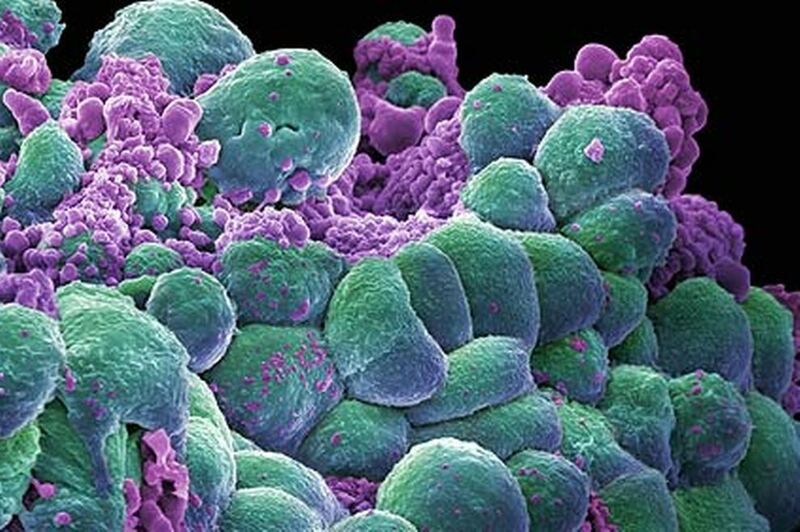 *Stromal cells. kid, kidney of the host mouse. (F) Vascularized glomeruli formed upon transplantation at day 20. Left panel: magnified images of panel E. Right panel: magnified image of the square in the left panel. Note the enlarged Bowman’s space. (G) The endothelial cells are of mouse origin. Staining of WT1 (magenta) and MECA-32, a marker for mouse-specific endothelial cells (green). (H) Hematoxylin-eosin staining showing red blood cells in the induced glomeruli. (I) Hematoxylin-eosin staining showing the eosin-positive precipitates in the Bowman’s space. (J) Staining of nephrin (magenta) and CD31 (green). Right panel shows the basal localization of nephrin. Scale bars: A, C–F, I: 100 μm; B: 1 mm; G, H, J: 10 μm. At day 20 after transplantation, we observed enlarged transplanted tissues beneath the capsule (Supplemental Figure 5B). Histologic examination revealed excessive growth of stromal cells of human origin, which were presumably derived from nonrenal tissues that were coinduced with nephron progenitors from iPS cells (n=4) (Figure 6E, Supplemental Figure 5C). Nonetheless, glomeruli were formed and the blood vessels were well integrated into the glomeruli (Figure 6, F and G). Moreover, 90% (135 of 150) of the glomeruli contained red blood cells (Figure 6H). Indeed, some of the glomeruli showed an enlarged Bowman’s space and contained eosin-positive precipitation (Figure 6I), which might imply a small amount of urine production. Interestingly, endothelial cells in the induced glomeruli were of mouse origin (Figure 6G,Supplemental Figure 5D). HUVEC-derived endothelial cells were not integrated into the iPS cell–derived glomeruli but were located separately from the sites of nephron formation (Supplemental Figure 5E). Therefore, HUVEC may not be competent to interact with human podocytes. The anti-human specific podocalyxin antibody stained the apical domains of the iPS cell–derived podocytes, but not those of the host mouse podocytes (Supplemental Figure 5F). Nephrin protein in induced podocytes was localized at the basal side that faced the vascular endothelial cells (Figure 6J), suggesting the emergence of filtering apparatus. Electron microscopic analyses of two additional samples at day 20 showed that iPS cell–derived podocytes accumulated around, and were closely associated with, endothelial cells (Figure 7A). The induced podocytes developed numerous complex cell processes, as well as a linear basement membrane, at interfaces with endothelial cells (Figure 7B). The distances between the cell processes of some podocytes were enlarged, and slit diaphragm–like structures were formed between the processes located above the basement membrane (Figure 7C). Each of these diaphragms appeared as an electron-dense line (approximately 35 nm wide, 10 nm thick) bridging adjacent cell processes of the iPS cell–derived podocytes (Figure 7D). This feature was also observed in vivo and differed from the immature ladder-like structure that was seen between adjacent podocytes cultured exclusively in vitro without transplantation (Figure 4). Endothelial cells also produced basement membrane, but it was not fused to that of the podocytes in most cases, thus forming double-layered structures (Figure 7E). Interestingly, endothelial cells were fenestrated with residual diaphragm, a characteristic feature of embryonic glomerular endothelial cells (Figure 7F).40Furthermore, an electron-dense substance was detected in the Bowman’s space (Figure 7C), as in Figure 6I, implying the possible presence of filtration. Taken together, glomeruli generated from human iPS cells were vascularized and had many morphologic features present in glomeruli in vivo. iPS cell–derived glomeruli in the transplants exhibited many morphologic features of those in vivo. (A) Induced podocytes surrounding the vascular endothelial cells and extending many cell processes, shown by transmission electron microcopy. (B) Complex cell processes of podocytes formed between the cells and above the basement membrane. (C and D) Formation of slit diaphragm–like structures (arrows) between the cell processes of induced podocytes. Note the electron-dense substance in the Bowman’s capsule (asterisk). (E) Formation of double-layered basement membranes, each derived from endothelial cells (white arrowheads) and induced podocytes. (F) Fenestrated endothelial cells with diaphragms (black arrowheads). bm, basement membrane derived from induced podocytes; en, endothelial cells. Scale bars: A: 1 μm; B, E: 0.5 μm; C, D, F: 0.2 μm. We have inserted GFP into the NPHS1 locus of human iPS cells and successfully differentiated them toward three-dimensional glomeruli. The GFP-positive–induced podocytes possessed apicobasal polarity and were equipped with primary processes and slit diaphragm–like structures. Furthermore, sorted podocytes exhibited typical transcription profiles that overlap with those in vivo. These findings underscore the authenticity of our induction protocol.NPHS1 promoter–driven GFP expression is a good indicator of glomerulus formation. Several groups have reported the induction of kidney tissues in vitro,13,41–43 and our iPS cell lines will be useful for assessing the induction efficiency of glomeruli by each protocol. In addition, we successfully sorted human podocytes using a combination of anti-nephrin and anti-podocalyxin antibodies. These reagents will make genetic GFP integration unnecessary for the purification of podocytes from patient-derived iPS cells, and possibly from more complex in vivo tissues. It is surprising that well organized glomeruli are formed without the other two components of glomeruli: mesangial and vascular endothelial cells. These two cell types are not derived from nephron progenitors, as shown by cell lineage analysis in mice,8,44,45 and indeed we did not detect these lineages in the induced glomeruli (Supplemental Figure 3D). Thus, glomeruli can self-organize their structures solely from the podocytes derived from nephron progenitors, without any inductive signals from mesangial cells or the vasculature. However, further maturation will be required to reproduce hereditary glomerular diseases. We developed a new transplantation technique using agarose rods to secure a space against the tension evoked by kidney capsules. This technical improvement led to the successful generation, for the first time, of vascularized glomeruli derived from human iPS cells. The induced podocytes exhibited complex cell processes with slit diaphragm–like structures, and linear basement membrane that ran along that of the endothelial cells was formed. Furthermore, endothelial cells were fenestrated, which is a characteristic feature of glomerular endothelial cells. Most experiments used agarose rods soaked with VEGF to potentially accelerate vasculogenesis; however, the absence of VEGF in the rods also caused the formation of vascularized glomeruli (Supplemental Figure 5G). Thus, we can at least conclude that the human iPS cell–derived podocytes expressed sufficient attractants, including VEGF, to recruit endothelial cells. It is noteworthy that the integrated endothelial cells were of mouse origin from the host animals but were not derived from HUVECs, although both vascular sources were initially located in proximity to the iPS cell–derived transplants. Therefore, human podocytes recruited mouse endothelial cells despite species differences, while HUVECs may not be competent to interact with human podocytes. Even when we performed transplantation without HUVECs or MSCs, we observed vascularized glomeruli, suggesting that paracrine effects of these cells may also be minimal (Supplemental Figure 5H). The presence of double-layered basement membrane might be caused by the incomplete fusion between those derived from human podocytes and mouse endothelial cells, as observed when mouse embryonic kidney was transplanted onto a quail chorioallantoic membrane.46 Therefore, the identification of optimal sources for human endothelial cells is necessary. While it is difficult to estimate the gestational age on the basis of the morphology of the individual glomeruli,47,48 waiting for a longer period after transplantation may help further maturation of induced podocytes. However, we observed an excessive growth of stromal, presumably nonrenal, cells in the transplants. Thus, it will be essential to develop methods to purify nephron progenitors for transplantation. At the same time, it is necessary to induce genuine stromal cells because both interstitial cells and mesangial cells are derived from renal stromal progenitors.45 At present, we have no evidence that proper mesangial cells exist in our vascularized glomeruli. Ideally, human endothelial and mesangial cells that correspond to those in the developing kidney should be combined. Although further induction studies, as well as imaging techniques to visualize the slit diaphragm with a higher resolution,49are needed to achieve this goal, our results will accelerate the understanding of human podocyte biology both in developmental and diseased states. These kits will minimize the time needed for optimizing a biomaterial-stem cell combination in preparation for research and development.